Blurb: I will never trust another human being again. Review: Ho. Ly. Crow. This book blew my mind! And I hadn't realized it until I read it that there has been a distinct lack of aliens in the YA world (when compared to other paranormal creatures). NOT ANYMORE! 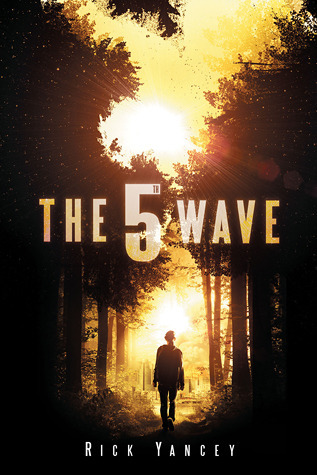 The 5th Wave fills that hole and THEN some! This was the kind of book that kept me up until 1 or 2 in the morning because I just kept saying "one more chapter. Okay. One more." Hence it's "Squeaky Book" designation. I found the characters compelling, the story absolutely engrossing, and the morality wonderfully complex. I was especially pleased that Yancey did a wonderful job switching points of view and still keeping me engaged in EVERY story. Oftentimes switching PoV just frustrates me because there's only one story I care about. Not so with this book. Every time it switched viewpoints I thought, "Yay! They're back!" If there's one thing that I have to say against this book (and the reason it got 4.5 flowers instead of 5) is that it does have quite a bit of profanity. Actually, it doesn't have all that much, but what it does have is extreme. The reason why that didn't totally throw me off is because my big problem is with pointless profanity. Now, I don't like profanity ever, but I can at least understand/tolerate it when the characters are under duress. And these characters were under a lot of duress. All in all a FAAAABULOUS book. Yancey doesn't disappoint! Wow, another rave review for this one, huh? Guess we should give in and check it out. ;) Thanks! So are we talking F bomb status swearing? It makes me made when I find those in books I like, so I don't want to read it if it has F bombs. Yes. There are 2 or 3 f-words.